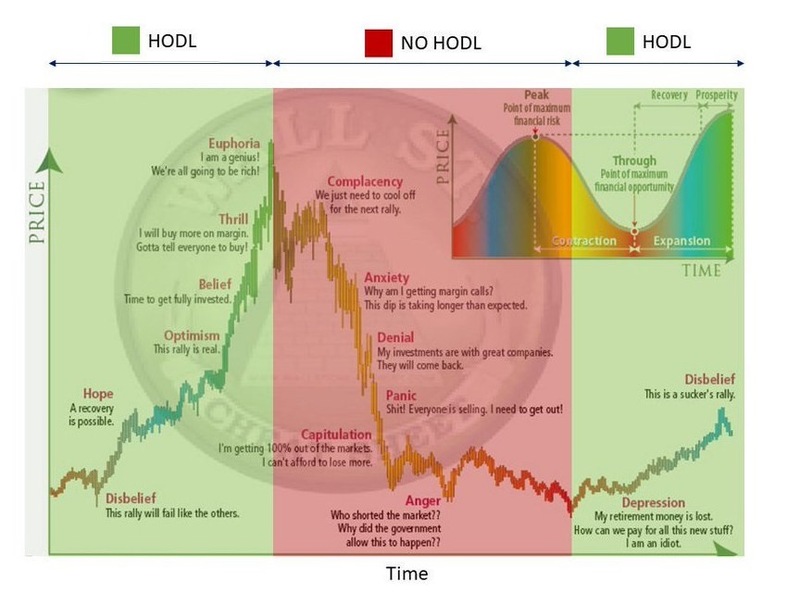 Found on Mark Rees Hodler group newsletter. A close below the previous low of 9260 will confirm the double top. That would be in line with the current longer term bitcoin downtrend. Currently bitcoin is trading at 9000. More likely than not, we retest 6000. $6k $11k $6k ..... cycle??? I actually hope BTC will continue to oscillate between $6k and $11k for a while. I exchanged half of my BTCs for gold on vaultoro.com a few weeks ago. When it hits $6k I'll start exchanging all of the gold for BTCs and vice versa when it gets to $11k. I will double my BTCs after a few cycles like that. Just a crazy question. As the difficulty level for mining increases, the electricity cost increase too. Is there a point at which a crossing of some limit of the bitcoin price - to - mining cost ratio, could trigger miners to switch to purely transactional costs? Is there another point at which the bitcoin price-to-transactional cost would make it not pay for miners to complete valid transactions, and start dropping off the spectrum? As that happens, is there a point at which the miners might get their massive computing power dedicated to fraudulently forking a large portion of the system in a single massively parallel denial-of-bitcoin attack that seizes B/c from valid accounts? Trends in motion tend to stay in motion. Just saying. Don't depend on 6k holding. I don't have special knowledge or anything....just...things tend to just keep going in the direction they're already going. "I shot an arrow into the air...where it lands, I know not where." I've mentioned Willy Woo's NVT ratio before, he now has an indicator, he also is a fan of referencing Google Trends like yourself and Chris. There's also news on the Mt Gox sell offs being responsible for the big recent dips, you might want to google it, if I put too many links in here the PP web system doesn't like it. 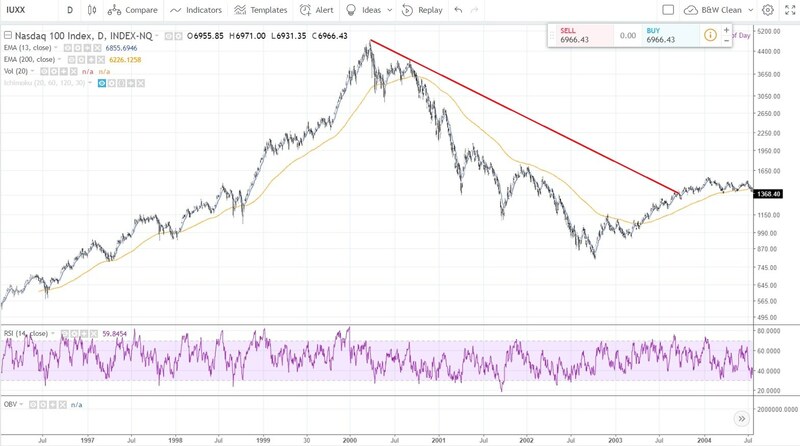 I find his trendlines suspect in "picking the bottom" (I'm always suspicious when people say that "today marks the bottom") since if we applied his trendline rule during this downtrend, it would have "picked the bottom" at least once before. His indicator is probably more interesting, although my concern about publicizing such things is that if they become more popular, the whales will be motivated to game them. Anyhow. I see a confirmed bitcoin double bottom right now, which suggests a near term low might be in place. My 2h and 4h code both agree its probably time to buy - and 4h forecaster issued a buy signal 8 hours ago. I've been having problems with my data source - there were 2 recent ticks with bad "low" values which threw everything off. I had to edit my data by hand, which was really annoying. Daily chart forecaster also issued a buy signal today. That provides the larger trend context. "A" low rather than "the" low. Not financial advice, etc. Wonder if Mark has any thoughts on this, it's particularly interesting as there's less than 20% of BTC to be mined. What dynamics come into play if BTC volatility means miners aren't remaining profitable? I guess it will spur on use of efficient renewable energy efforts for cheaper running costs? Here's info on the Mt Gox trustee selling, strong correlation with the plunges south.. I'd like to track new money flows in from retail noobs, institutions buying would be harder to track but I expect to be significant in the coming months, other than Google trends I wonder if the exchanges release data for new members? Pure speculation (not my charts), but entertaining, next few hours we should see which way the whales and bots take BTC. I've also been considering the Mt Gox news correlating with the dumps is actually potentially good, especially if future returns of BTC are just return to customers and will not be sold off on an exchange, an OTC auction may also be setup. Don't jump on Gox yet. If you want another graph, pull up Palladium, and see how it leads gold. So you might want to hold off on the BC, for another six months or so, till you're sure the bottom is in. BTC is still in a downtrend on the daily log charts, could be another month before it breaks that downward diagonal. We could well retest 6k & even flash below as DaveF has said. If that happens it will be unloved for a while but a good time to steadily accumulate along with institutional buyers of it and ETH. Miners set the absolute floor price? Will some miners temporarily attempt to run at a loss for a while just like those of PMs when it's unprofitable to mine silver/gold? You can see why certain nations are more attractive than others are for running mining operations. I wonder what Mike Novogratz's new Canadian venture Hut8 electricity costs are? How much will this massive usage cause a greater need for efficient renewable energy sources? What will it do to prices of scarce natural resources? G20 could create a nice bit of FUD to assist with cooling off BTC. I like comparing BTC to the NASDAQ 100 from the Dot Com boom, replacing NASDAQ years with BTC months. So maybe revisiting Septembers lows in the next month or so isn't beyond reach.. Speaking of the NASDAQ, it just formed a nice Standard Bearish Divergence Reversal on the Daily timeframe, time for its PPT to kick in before it really plummets? Translating Standard Bearish Divergences to hunt the top of human sentiments, you maybe intrigued to know BTC completed them on the 4hr timeframe on its ATH on 17th Dec and its recent Failed runs on attempting climbing to attack the downward trendline on 20th Feb and 6th March, the latter date is when Mark wrote his original post above. Given FB and Google are the two 900-pound gorillas in the ad space, this is probably a bad thing for the "google trends" buy bitcoin charts. They're already in a downtrend, and this likely won't help. Daily chart double top is confirmed, and that suggests we are probably heading for a retest of 6000. Mostly because "nobody cares". That's easily visible in the fees, which are back to September 2017 levels - when bitcoin was trading around 4000. I think it is fascinating how the hype/enthusiasm was so intense one minute, and then gone the next. What's that about? Was it engineered, or was it an emergent property? Does social media act as both an amplifier while at the same time dramatically decreasing attention span? Might bitcoin-time and facebook-attention-span be closely related? "Enough with bitcoin. Back to pictures of kittens and puppies." Bottom feeder hungry at 7.6k? I see this spring/summer as a fantastic opportunity to accumulate while it is unloved, the price will rise soon enough for BTC/ETH and other solid projects, plus Crypto Mania v2.0 will kick in possibly by Xmas. The most recent drop to 7700 was a buy. I also saw some metadata which suggests there was some big volume on the blockchain, which sometimes accompanies lows. Also maybe 50-100M of USDT transfers, which sometimes mark lows. Longer term, it seems to be a 'sell rallies' sort of mood right now, so buying is is high risk. Scalping a quick 7-10% seems doable - but you need to be both quick and lucky. Forecasters don't work so well in downtrends, because you can't go short (at least in small size) with bitcoin. I'm making some adjustments to my reversal code right now which should help things resolve a bit better. Early indications look good, but its not done yet. EDIT: here's what I mean. It only messed up once. And it is saying "sell" right now. Problem is, there is a 20-30 minute delay after the bar is complete for me to wait for the last block to come in, and then do all my calculations, so "fast" may not be fast enough. My current view (it changes often based on new info/understanding) is we maybe near the bottom of this 3 month correction. Hoping we'll see 7.1k in the next week, I will buy it if we get close. Will we see last summer's prices? Further graph, I would now be surprised to see as low as $2-3k again unless Tether or Wall St take the market down. Very bullish long term. It took 15 months after the Dec 2013 peak for prices to stabilize. We're 3 months in. Looks like there was a big headfake higher in May, 6 months in that sucked everyone in, only to crush them 2 months later. Wow, thanks for that angle, one helluva drop! I should of said just because I intend to buy in 7.1k doesn't mean I definitely think we break the daily down trend, but I would like to ride it up to challenge it again for 30% increase?? and then take action accordingly. As Adam's article on Fixed Mindset alludes to I need to be able to change my mind as I learn and new facts become apparent. Regarding 2013, this shows it in perspective to the logarithmic regression projection its from the article I linked to earlier. So I'd say looking at that and noting what happened with Dec 2017, you could argue we are already under valuation. Along with new developments like lightning network, approved regulation and institutional buying I still believe we will see BTC over $20k this year, possibly $24k. The whole market is likely to grow too, yes still tons of duff ideas with dodgy ICOs and more useless scams but there will be solid industry changing projects that Mark helps seek out for us. Could BTC go lower again in the next few months and languish until the autumn? Yes absolutely, if it does I hope to steadily accumulate while I can. BTC reaching another decision point? Edit: Looks like it made a decisive move, the question is what bought it was it Tethers? b) there will be a repeat of the 2017 bubbly/frothy/bitcoin stampede. The most recent impulse was very clearly the result of a "madness of crowds" event. Google trends tells us this. Not because all those people got underlying utility from bitcoin, but solely because of the herd effect. Same thing with the internet in 2000. Valuations weren't based on utility, just on herd effect. Now then. To come up with a reality check on the forecast, we have to figure out how many "herd members" it took to get bitcoin to each of the levels on the chart. Let's say there were 50 million bitcoin cows in the 2017 stampede, and that got bitcoin to 19k. One would assume, then, that you'd need at least 5x that many stampeding cows to get bitcoin to 100k. Is that doable? Sure. 4% of the world's population would have to be involved in the stampede. But I'd say that's the ragged edge of doable. Of course, that's based on my wild-assed guess as to the number of bitcoin cows worldwide that participated in the 2017 stampede. BTW, there was about 100M in USDT transactions in the 6 hours prior to the $300 pop. Ultimately like any money, its a belief system. The price rising in 2017 created a stampede and media reporting helped it become a feedback loop from the spring/summer onwards. What part did Tether play in this, not sure. The current floor price could well be mining costs, some may find it hard to stay in business if we go and stay below $6k. The cows assumption is amusing I like it. Surprisingly given the exponential nature of things, it does however appear to have a linear relation with the number of cows in a herd and the expected price movement. Interesting find on the Tethers, was that from one of the links I'd posted previously, grateful if you could share, so the market goes up by a 1000 in the next couple of days and then tanks again to test 7k regions?? My guess is, Tether + wash trades + tape-painting played a large part in engineering the rally. But that's just a guess. Who inside the bitcoin community would want to spill the beans? If the price rises, all the bitcoiners everywhere are happy. Yes? But it took real money to propel it to 19k. And real money we saw, sucked in from the general public. How many of them will have been rinsed out in the drop from 19k to 8000? (or 6000...4000...2500)? I suspect that's why price takes a while to recover. People have to get over the shock of losing all that money. And a new collection of cows needs to be recruited. How many cows participated in the 2017 stampede that were rinsed out in 2013? That would be interesting to know. I'm sure you've seen this chart - cumulative USDT grants since 2017. Looks like USDT was enough to get the rally going, then the flood of public money came in, the insiders sold out (like they always do), the public got hosed, they tried to play the USDT grant trick to stop the sell-off, but it was like bailing out the Titanic with a thimble. And now with all the publicity, they don't dare play the USDT-grant trick any longer. I guess there's just so many billions in fake crypto money you can print before people start to notice. And ... if it took the USDT grant trick to propel bitcoin to its launch point (where it then became that feedback loop you describe - which I agree with), what will do it next time? Tether again? CFTC is now saying bitcoin fraudsters may be prosecuted by them. Can you imagine - bitcoin w/o fraud? The price would collapse! At this point, I have to express my appreciation that the bitcoin world is so different from the nasty old world of the skimming, cheating, scheming banksters. We need to update this book for bitcoin. I remain convinced that remains an enormous scam and that when it blows it will take a long, long time to recover from psychologically, if ever. At a minimum there will be calls for regulation of the markets, which kinda kills a big part of the premise underlying the cryptos. Worse, regulated markets are the ones the big banks have the best chance of skimming from for personal gain. Can they be trusted to only skim a little and leave enough fuel for a big rise? I dunno ... can you teach scorpions empathy? I suspect that's why price takes a while to recover. People have to get over the shock of losing all that money. And a new collection of cows needs to be recruited. I just discovered that I owe the IRS $50k that I don't have, because I traded in cryptos. Am I fucked? I make $47k a year at my job as an office assistant. At the advice of my friends, I took most of my savings and bought 8 bitcoins back in early 2017 for about $7200. You can imagine how I felt when it went up. Around December 2017, I got caught up in the altcoins frenzy and sold most of my bitcoins (about $120k worth) to buy a bunch of different coins. I didn't know this back then but it looks like I owe income taxes on those trades, which adds up to about $50k if I add up state (California) and federal. The big problem for this person is that they are indeed fucked. They sold their coins for massive gains in December 2017. Good move but they rolled it all into alt-coins which then went down. The IRS only cares about the gains in 2017. Gotta pay taxes on those. If you then report big losses in 2018 on your alt-coins, the IRS could not care less. Your problem. Losses can be carried forward, but gains cannot be back-adjusted. So this person either has other gains equal to their losses over the next three years or they lose the benefit of those losses. Pay your taxes on bitcoin…or else. Late last year, the Internal Revenue Service persuaded a federal judge to require Coinbase, a San Francisco-based digital-currency wallet and platform with about 20 million customers, to turn over customer information. Driving the IRS’s decision was its belief that few bitcoin investors appear to be paying taxes due on sales. The court order is one of the agency’s first moves as it clamps down on cryptocurrency scofflaws. By March 16, the IRS will have data on about 13,000 Coinbase account holders who bought, sold, sent or received digital currency worth $20,000 or more between 2013 and 2015. The data include the customer’s name, taxpayer identification number, birth date and address, plus account statements and the names of counterparties. Criminal tax lawyers expect the IRS will act on the information and high-profile cases will follow. Not many things spook herds quite like that phrase. ...or maybe beer and tuna. Might be time for some folks to set up an "easy payment plan" with the goobermint types. I know you see the coin world (to some degree) as some brave new world that will do amazing things, but viewed through my lens, the current setup seems to be - largely - just another mechanism for stripping wealth from the unwary. Almost by accident, over the next 10 years, we might get something interesting out of it, technology-wise. In the meantime, I suspect a lot of people are going to lose a lot of money chasing the dream. Kind of like the Internet in 2000. It will be fascinating to see how bitcoin & friends do during the next correction. Then we'll know what it really is all about. I have my eye on ETH. So far, ETH/BTC ratio is not looking happy. But at some point, the decline will stop. Bitcoin may have the brand, but I think ETH has a bit more utility. As an engineer, I have this thing about utility. Chris makes a good point about the tax involved, its something Mark has been sharing videos on recently. Back to our cows and sheep, I forgot to mention the wolves are waiting. Maybe the institutions will take the lead and pump so much money in to the market this spring that more folks take notice again. They also have the capability to manipulate it further, take it down at their pleasing, probably utilising expert traders experienced in such practices from the Gold and Silver markets? Dave - have they shown up on your searches? Market pumps to test $10k then dragged down again? I'm keeping my eye on the BTC/Gold ratio. It looks like it bottomed out a day or two ago and is now heading up. I'm now exchanging a lot of my gold for BTCs. Careful these are choppy waters, still downward on Daily timeframes, heavy resistance at 9.5k and 10.1k is the downtrend diagonal, also incoming 50/200 Daily Death Cross in approx a week. Would not be surprised to see below 8k again by early April. Out of interest which exchanges do you recommend for swapping PMs & BTC? Miners are buying electricity at wholesale. This is currently at 3.6 cents. They are planning ahead and power brokering entire powerplants for the year. They can make a profit down at $2k BTC. It will drive the less-efficient miners out, but the most efficient will move in. Anybody thinking this thing is going away is in for a rude awakinging. Behind the scenes things are just getting warmed up. $50k btc in 2018 is on the table. I feel bad for this lady. She got some terrible advice. Investing in this new asset class is risky and people should only be willing to invest as much as they can afford to loose. There are a lot of scams, and the swap needs to be drained. The SEC is working on that and I applaud them. We are going to see a major separation of utility tokens and security tokens with the new emerging ST20 standard on ethereum to run along side the ERC20 token standard. Clarity is coming in the regulations and the SEC brokered the sell of Poloniex crypto exchange to be sold to Circle, who is a partner with Goldman Sachs. The ICO market has cooled and the language of the space is changing to adapt. The space is maturing. The trouble is people like this lady need trusted resources to keep them out of trouble. The neighbor or guy next door is not a crypto expert. They need to finder leaders. For those that think this whole blockchain idea is going away might be surprised to see their own industry disrupted. You are ether the disrupter, or history. Here's a video we use in the crypto crash course to start to see the possibilities of industries being disrupted as we speak. Is yours? I'm beginning to sense the potential of a "bit-tax" to be imposed on ISP's as a centralized mode of financing government functions. ISP's wouldn't be the only targets, however. Current technologies (TV service providers, electric utilities, water and sewer) are successfully being monitored and subject to volume based charges. As more and more major players (Goldman Sachs, Verison, et. al.) look to explore block chain technology, doesn't it follow that governments would choose to simplify taxation, not by taxing the products of technology, but the technology at the source? Do you enjoy "live-streaming" Netflix; "Ka-ching; watching tax". The NSA is in a perfect position to push for increased funding of its work in anticipation of these developments. Think Facebook doesn't know what you've been up to? Decentralization is a great concept, but there will always be "gate-keepers" somewhere in the system. And, what is to prevent major providers from seeking volume discounts from the governments and passing the tax on to the users. Is moving to a block-chain concept really decentralizing or is it just a better way to tax everything except the air we breathe? Take everything you think about bitcoin, rightlick. Delete. The world as you know it and you describe above is already history. You speak of the old paradigm continuing with just a slight knowledge of the world to come. What is coming will seem science fiction. Take a look at this graphic for just a sence of the tital wave of change we can see. It goes far beyond. Web 3 will be mostly unlike web one. ISPs? where we are going, we don't need ISP.s - Or user names, Most everything you worry about might be moot. From what I can see, blockchain is only as good as its connection to the real world. Garbage-in garbage-out so to speak. I'd call that the USDT phenomenon. Every one of those USDT transactions aren't hackable, its all very secure, but there may well be no USD behind the USDT, because the linkage between what is claimed as a bank balance by USDT, and the actual balance for USDT, is just a promise from our friends at USDT that the money really is there. Its a problem as old as the hills, and blockchain absolutely doesn't solve it. As a result, you've got a nice secure transaction linkage backed only by a bunch of hot air. Same with all those fraudulent ICOs. Secure tokens, backed by fraud. Certainly if the banking system exported the USDT "bank balance" onto some sort of public ledger, then this problem would be solved - assuming the bank wasn't itself lying about the balance. At the very least, it would be a step forward. But would banks be willing to expose bank balances in real time to the public at large? Boy, the info that could be gleaned from watching those transactions! Here's the main point. Bitcoin itself is self-contained. It needs no external trusted references to disrupt anything. Bitcoins circulate on the ledger. It is a closed system. It is the easy problem to solve. Anything that moves beyond bitcoin - attempts to disrupt other areas - requires that the inputs be trusted and verifiable. That's not a small thing. I refer to my thought experiment with "verified gold crypto" which, in essence, is just a warehouse receipt system just like USDT. It requires you to trust the vaulting company to properly report the number of bars that back the proposed "crypto-gold-loco" tokens. You can construct linkages to the back office systems of the vault owners, but then you assume those back office systems cannot be hacked or spoofed. (Example: vault had a robbery; vault company decides to cover it up, and reports fake bars counts showing that all is well. I.e. a "gold vault" version of Mt. Gox.) Otherwise, its garbage-in, garbage-out. Just like with USDT. At some level, the mechanism for trusting/verifying the inputs to the blockchain, for anything beyond self-contained bitcoin, is the key to determining whether or not slapping a public ledger onto an existing trust problem actually ends up helping things or not. Otherwise you end up with a secure mechanism for engaging in fraud. ...a secure mechanism for engaging in fraud. That one jumped out at me too, and I was just about to comment on that but you already did it. "a mental condition characterized by delusions of persecution, unwarranted jealousy, or exaggerated self-importance, typically elaborated into an organized system. It may be an aspect of chronic personality disorder, of drug abuse, or of a serious condition such as schizophrenia in which the person loses touch with reality." ...the goobermint "has our backs". I'm one of the most nervous of us crypto-freaks out there, especially since I'm a baby boomer. If my BTC+Gold holdings gain 25% in the next few months I'll move 90% of it into silver and let it sit there. The dollar value of my BTCs ballooned from 5% to 50% of my net worth in the last 2 years without spending a penny since then, so I do have an itchy trigger finger hovering over my mouse. I use Vaultoro.com for my day to day exchanges and goldmoney.com for more permanent storage. I can exchange BTCs for gold/silver/etc and vice versa at goldmoney.com, but I can not take possession of my remaining BTCs and safely store them in my hardware wallet like I can with Vaultoro.com. The goldmoney fees are also twice as high as vaultoro's.